Opened in Delhi in 1956, the All India Institute of Medical Sciences (AIIMS) is an enormous government-funded hospital, anomalous in the Indian public healthcare landscape for employing many of India’s most respected doctors, who provide high-standard free or low-cost care to patients of low socioeconomic status. 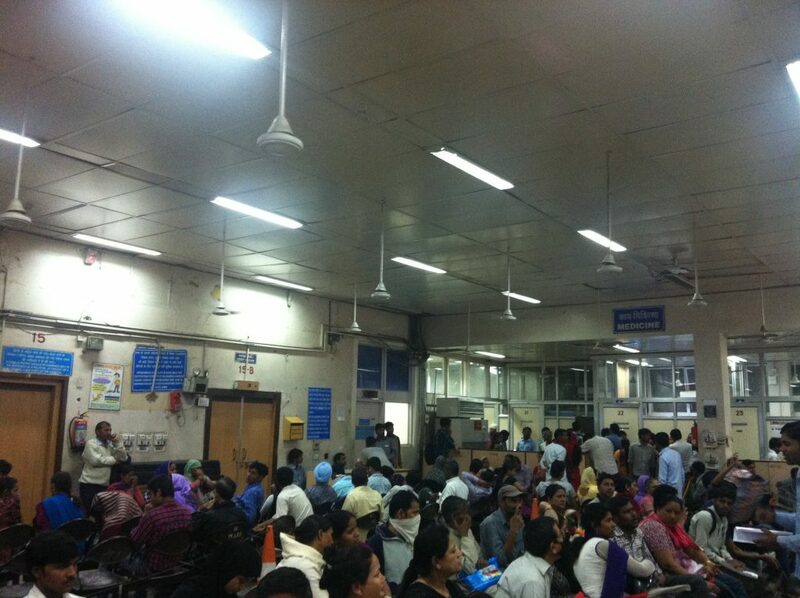 The AIIMS outpatient department (see Figure 2) sees an average of 10,000 people a day. Many of these patients travel from across northern India, seeking competent and affordable treatment that they cannot find at home. AIIMS also occupies an undisputed position atop the hierarchy of Indian medical education. Each May, around 90,000 candidates compete over 72 seats at the college, making for a notorious acceptance rate of less than 0.01%. The tiny minority of successful students are catapulted into an exclusive club, with their achievement celebrated in the national press. 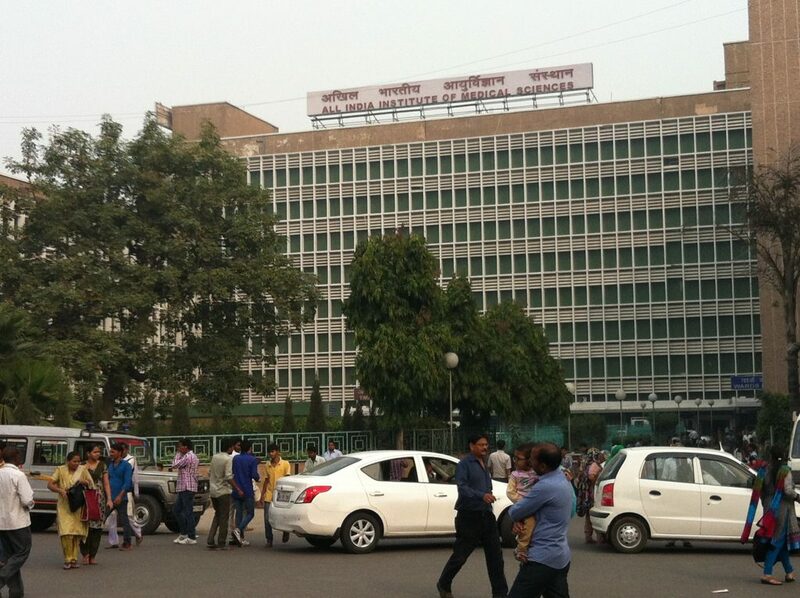 Virtually everyone has an opinion about AIIMS, especially in Delhi. AIIMS is there: embedded in the landscape, and in the imagination of people both within and beyond the city. It is a phenomenon as much as a collection of concrete buildings. This in itself made it a compelling site for my PhD research. Its relative neglect by social scientists added to the appeal. Writing about the challenges and rewards of conducting ethnography in public institutions, Didier Fassin (2013: 642) notes that while ethnography must pay attention to understudied social locales, it also retains salience in ‘spaces saturated by consensual meanings’. In the first circumstance, he writes, ethnography ‘illuminates the unknown; in the second, it interrogates the obvious’ (ibid.). AIIMS encompassed both sets of circumstances, making for a research site that was both enticing and particularly challenging to access. In April 2014, having listened patiently to the wry and occasionally despairing account of my effort to gain research access to AIIMS, a friend gave me a copy of Kafka’s The Castle. In the novel, K. arrives in a village believing he has been appointed as a Land Surveyor by the authorities that inhabit The Castle, which sits on a hill and pervades the life of the village. The story revolves in increasingly dizzying circles around K’s efforts to have his position recognised by The Castle in order that he may begin work. The challenge of securing access to AIIMS was similarly inflected with moments of comedy, suspicion, despair, and, ultimately, triumph. …in things of that kind the Castle moves slowly, and the worst of it is that one never knows what this slowness means; it can mean that the matter’s being considered, but it can also mean that it hasn’t yet been taken up … and in the long run it can also mean that the whole thing has been settled, that for some reason or other the promise has been cancelled … One can never find out exactly what is happening, or only a long time afterwards. I arrived in Delhi in January 2014 believing that arrangements were in place to begin my research at AIIMS, following nine months of preparatory work. This began with an exploratory trip to Delhi in April 2013, during which time I met senior doctors and administrative staff. One particular member of the administration informed me with a blank smile that my research was out of the question, and that if I ‘applied my brain’ to reading the guidelines he had thrust at me, I would see the truth of the matter. Through the same contact in London who had connected me at AIIMS, I was able to appeal to the Indian Ministry of Health and Family Welfare, and I did so, though not without a sense of discomfort about the place of elite networks in the facilitation of my research. Was my credibility as an independent scholar already compromised by my willingness to utilise such contacts, I wondered. And what grandiosity of intent was implied by my willingness to badger senior civil servants into letting me conduct my research? At the ministry, I was escorted to a desktop computer in an assistant’s office and told to write a letter to the secretary of health explaining the situation. I duly did so. From there I was ushered in front of the secretary himself, and was told to present him with the letter I had typed in an adjacent room a few minutes earlier: an early confirmation of the unassailable power of words on paper (see Gupta 2012; Hull 2012). The secretary read the letter and muttered something about AIIMS leveraging and resigning its institutional autonomy as it suited the circumstances. He looked up at me. With a letter from the ministry sanctioning my presence, I returned to AIIMS in 2014 feeling hopeful. From the outset, I was extremely fortunate to have the support of a senior doctor at the hospital – Dr B – whose good-humoured kindness and generosity continued throughout my fieldwork. Dr B had made it clear that he was helping me because his former AIIMS classmate in London had asked him to. He did express a genuine interest in my work and encouraged me to pursue it, but his initial motivation spoke to the network of relationships that enabled my pursuit. While personal perseverance was crucial, gaining research access was by no means a solo effort. I remain convinced that I would not have been granted research access without Dr B’s support, and during fieldwork his existence as my very own key informant reassured me that things do occasionally materialise as the methods books anticipate (Aull Davies 1997). Dr B responded to each new obstacle as a challenge to be circumvented, and his optimism that I would eventually be granted permission was crucial when things looked bleak. The letter from the ministry proved to be insufficient in the eyes of the AIIMS administration, and I was left unsure of my next step. The limbo in which I found myself provoked not just practical anxieties, but also an unsettling period during which I incessantly questioned not just my choice of research site, but the utility of the PhD as a whole. I watched as my colleagues buzzed around town, gleaning fascinating insights from their interlocutors, or dredging up gems from the archives, and I felt my self-worth tremble. I was increasingly tempted to evade the radar and begin work inconspicuously in what was after all an enormous hospital. I wondered if I had been too concerned about the rules, and was left looking foolish by my counterproductive conformism. Or whether it was time to choose a different site for my research. My inclination to pursue new avenues, however, was qualified by an internal quandary about the length of time for which I should persevere. Beyond the ramifications for my own PhD, and perhaps thereby elevating my doubts above personal angst, I also questioned whether I had a degree of responsibility to the wider pursuit – whether of anthropology specifically, or of the social sciences more broadly. Which was to ask, having determinedly opted to conduct research in a notably understudied public institution, should I now be committed to seeing it through, or risk undermining the entire endeavour by changing course and admitting defeat? Fortune rescued me before I had to make a final decision, but the thoughts about scholarship at the intersection of individual and collective endeavour persisted. I summoned patience and sought the counsel of Dr B. Having consulted a colleague, he decided that the best strategy was now to go straight to the director. I was enthusiastic, while conscious of this potentially being the end of the road. In the director’s office, I felt Kafka’s spectral presence as I realised that the head of the institution wasn’t going to give a definitive answer to my request. Instead, he recommended that my case be referred to a dean I had met a year earlier during my exploratory visit. I would like to write that I stifled a laugh at the pronouncement, but in fact it was more a wail of despair that lodged in my throat as I felt the ground beneath my feet morph into quicksand. I mustered a few words of unconvincing gratitude and trudged back through the AIIMS gates, no closer to my goal. A week or so later, however, I was surprised by a friendly email from the dean, with a date for a meeting. When I arrived, the dean was absent, but upon my insistence that I had an appointment, his assistant reluctantly summoned him. The dean seemed a little nonplussed by my presence, but he was very supportive, and appeared about to grant me permission when he decided to consult my greatest adversary in the process so far. This was the senior member of the administration mentioned above who had no intention of allowing my research to proceed (see Inhorn 2004: 2097 on such archetypal powerful individuals). In the dean’s office this particular colleague explained that ‘the problem’ was that I might publish my research and no one wanted to be responsible for setting in motion a chain of events potentially damaging to AIIMS and, by extension, India. For all that he had made a significant effort to block my access to the hospital, I felt a grudging respect for this explicit acknowledgement of what lay at the heart of his objections. It was not surprising, but it had until then remained implicit. In this light, the administrator proved to be the person most conscious of the potential power of ethnography as a method, which, as Fassin notes, may be perceived as warranting ‘avoidance, suspicion or prohibition’ precisely ‘because it allows witnessing where those in power do not want evidence of what is ongoing to be seen’ (2013: 630). Nevertheless, once I had official permission to conduct my research, not all doctors found my methods either threatening or alien. The research culture of AIIMS, while strained by the demands of clinical care, is an important facet of the institution’s identity, and I suspect this inclination informed the encouragement of my work by certain faculty members, even if it was in a very different vein to their own (see Inhorn 2004: 2100 for her reflections on a similar experience at a university hospital in Cairo). To my relief, the meeting with the administrators concluded with the agreement that I could return to the director with the dean’s consent, provided a senior faculty member would vouch for me. True to form, Dr B was generous enough to agree to take responsibility for me, provided I promised ‘to be good’. This was meant in jest and was a reflection of the rapport that had grown between us, but it also spoke directly to my discomfort about the implications of Dr B’s role for both him and me. When does affection for one’s chief informant, or concern for the impact of one’s research upon that individual, risk compromising the integrity of the work produced? Or, perhaps, when does integrity regarding these sometimes ambiguous relationships that straddle the border between the professional and the personal conflict with that pertaining to one’s scholarship? In her response to the ‘ontological turn’ in anthropological theory, Liana Chua (2015) reminds us of the importance of what she terms ‘co-presence’ in the production of anthropological knowledge. If, as Fassin (2013: 640) argues in turn, ethnographic research is in part a process of accumulating debts and the ‘intellectual production’ that follows a means of repaying them, or if, in Inhorn’s (2004: 2097) characterization, the anthropologist in a hospital setting cannot avoid being the client in a patron-client relationship, then to what extent do we risk embedding compromise within our scholarship from the outset? Shortly after our conversation, Dr B emailed to say that he had spoken to the relevant dean, but he no recollection of our meeting. Was I sure I’d met the right person? And so the most absurd episode revealed itself in retrospect, in which I had confused the academic dean with the dean of research. Much as I might have liked to attribute this inanity to an obstructive and labyrinthine bureaucracy, it was entirely my fault. Which prompted the reflection that in the midst of so many accounts of grand methodological dilemmas, ethical or otherwise, we hear little of those instances of human fallibility on the part of the researcher that entail their own direct consequences. In my case at least, the fieldwork ‘bumbler’ with her intrinsic comedy proved to be less endangered an archetype than Janelle Taylor recently part-lamented (2014). As he spoke I felt, to my surprise and slight horror, my eyes becoming moist. I was effusive with relief; how swiftly the institution that had consumed so much of my energy, that had been my greatest challenge for the previous twelve months, became the repository of overwhelming gratitude. I briefly feared that my critical capacities might be smothered by sheer joy at being made a legitimate presence within the Institute. But any blinding through gratitude proved a short-lived constraint, speaking for itself of the benefits of long-term ethnographic research. Later still, the distance enforced by the writing process allowed for the co-existence of a critical analysis of student life at AIIMS and an enduring gratitude towards the actors who facilitated my research. Accessing AIIMS took twelve months in total – a period of time both challenging and fruitful. The variety of strategies and personalities involved speaks to the specific characteristics of seeking permission to conduct research within a highly-respected government institution. Not that my experience can necessarily be considered typical, particularly outside India. While Phillip Abrams (1988) has written about the paradox wherein public institutions are more challenging to access than private organisations, Marcia Inhorn (2004) found gaining access to public hospitals in Egypt and Lebanon more straightforward than seeking the same permission to study private clinics. In Papua New Guinea, Alice Street (2014) describes how she was welcomed by the hospital staff as a witness to the challenging circumstances in which they worked. In my case, while everything hinged on the crucial letter of official permission that was eventually written by the dean of research, personalities and the establishment of rapport – those traditional hallmarks of anthropological fieldwork (Geertz 2000) – were central to the negotiation of the institutional labyrinth. The process revealed the necessity of significant social capital to even begin seeking access, and the various ways in which interpretations of power and responsibility are embedded in bureaucratic networks. That the implications of such structures resonate far beyond the gates of the hospital suggests on reflection that my fieldwork did not begin when I crossed the AIIMS threshold with permission letter finally in hand, but when I first knocked on an office door several months earlier, unsure of the reception I would receive. Abrams, P. 1988 . Notes on the Difficulty of Studying the State. Journal of Historical Sociology, 1 (1): 58-89. Aull Davies, C. 1999. Reflexive Ethnography: A Guide to Researching Selves and Others. London and New York: Routledge. Fassin, D. 2013. Why Ethnography Matters: On Anthropology and its Publics. Cultural Anthropology 28(4): 621–646. Kafka, F. 2008. The Castle. London: Vintage. Geertz, C. 2000. . The Interpretation of Cultures: Selected Essays. New York: Basic Books. Gupta, A. 2012. Red Tape: Bureaucracy, Structural Violence, and Poverty in India. Durham and London: Duke University Press. Hull, M.S. 2012. Government of Paper: The Materiality of Bureaucracy in Urban Pakistan. Berkeley: University of California Press. Street, A. 2014. Biomedicine in an Unstable Place: Infrastructure and Personhood in a Papua New Guinean Hospital. Durham and London: Duke University Press. Taylor, J. 2014. The Demise of the Bumbler and the Crock: From Experience to Accountability in Medical Education and Ethnography. American Anthropologist, 116(3): 523-534. Jiong Tu has written on this blog of similar experiences with officials fearful of the consequences of sanctioning research during her work on healthcare in China (https://blogs.lse.ac.uk/fieldresearch/2014/10/21/encountering-chinese-officials/). Anna Ruddock is an anthropologist and public health researcher with a regional focus on India. She completed her ESRC-funded PhD at the India Institute, King’s College London in 2016. Her thesis was an ethnographic study of medical education at the All India Institute of Medical Sciences (AIIMS) in Delhi, in which she interrogates the ways in which India’s most prestigious medical college creates new doctors, and the implications this process has for the broader landscape of Indian healthcare. Anna tweets as @annalouruddock. All articles posted on this blog give the views of the author(s), and not the position of LSE Field Research Method Lab blog, nor of the London School of Economics and Political Science. before commenting. This entry was posted in Featured, Gaining Access and tagged Delhi, gaining access, India. Bookmark the permalink.